There is a way to end BINGE EATING but very few women know about it! Instead they try to be strict with themselves relying on discipline, willpower and self control. They think if they resist their binge foods long enough, binge eating will miraculously disappear. Perhaps you’re TRYING the same….maybe you’ve been trying for years? So how is that approach working for you gorgeous? It didn’t work for me. At all. For 14 years I was a secret binge eating, turning to food whenever I felt out of control in my life, which happened often. I lost count of how many times I would beat myself up for binging on cake or breakfast cereal. Feeling so ashamed, guilty and annoyed with myself. I was too embarrassed to open up to anyone that I was out of control with food so all my binging was done in secret. The toilets at work. In the car. At home when I was alone. Anywhere I’d find myself alone with food. Since finding my own food freedom and putting binge eating in my past, I’ve learnt a thing or two about what works and what doesn’t. I know what the REAL triggers are (it’s surprisingly NOT food!) and I also know how to help you stop allowing food to control you to the extent it does at the moment. Now in order to stop binge eating, guess what?! Binge eating is something which CAN BE OVERCOME when you focus on addressing the CORE reasons why you binge. It’s not about focusing on STOPPING, rather focusing on defusing the REASONS WHY. …..WHEN you know why you’re doing it and, more importantly, what the steps are to finally stop it. We start with exploring what binge eating actually is and what the most common triggers are. We’ll explore food rules, diet culture and the desire for weight loss or fear of weight gain. We’ll also look into what your specific triggers are and where they are coming from and I’ll give you the tools so your current triggers are no longer triggers moving forward. How to relax, break the cycle of overwhelm and learn to switch your mind into instant calmness. Learning the tools I use all the time to ground myself, reconnect to my body and trust what I hear. 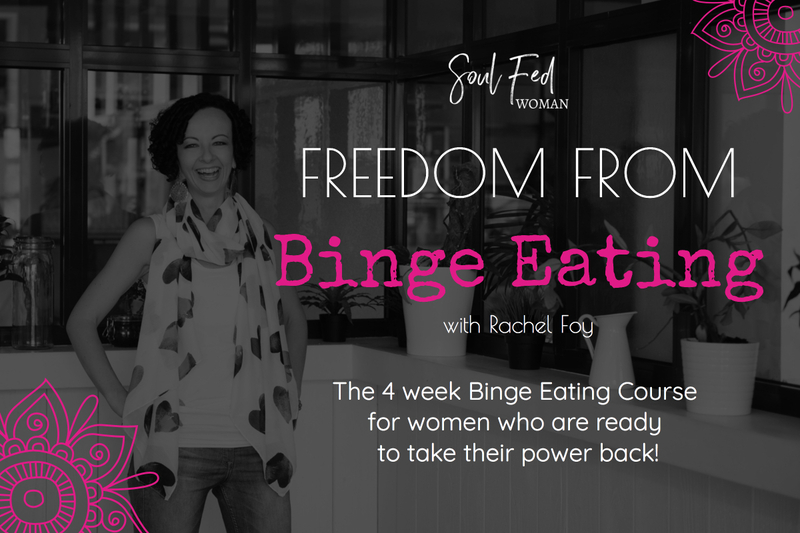 Binge eating can be defused when we learn to cope with stress, overwhelm, anxiety and fear so during week 2 I’ll be giving you everything I have to show you how relaxation and switching your mindset is the key to becoming binge free. Tapping or EFT for Binge Eating. I’ve used this bizarre tool for over a decade and in week 3 I’ll be showing you what tapping is and how to use it specifically for binge eating. I’ll share with you a crazy tapping based exercise which literally stops binges instantly and it’s something I discovered by accident whilst working with someone years ago! We will also explore you Inner Child and why the little girl inside you is more than likely in charge of your binge eating so I’ll show you how tapping can really help you and her to stop using food in the way you do. This is designed for anyone who answers ‘YES’ to ANY of these questions. Do you consider yourself to be a binge eater? Do you lose control with food several times a week? Do you binge eat in secret? Do you feel guilty when you think about the times you’ve binged? Have you tried to stop using willpower, self control and abstinence? Have you been diagnosed with Binge Eating Disorder? Do you struggle to live your life without food being at the centre of your thoughts? Do you avoid unknown situations where food will be available for fear of losing control? Are you ‘good’ with food during the week only to ‘fall off the wagon’ at the weekend and binge? Do you sometimes feel anxious and panicked that you’ll never be free from binge eating? You might want to be sit down for this part! Some of my private clients pay thousands to work with me on this level of mentorship. Yet the price which came through for this is much lower than it could be (I could easily charge so much more for this) but I’m not doing. I want this to be available to everyone! 4 x £50 - JOIN NOW! 4 x $70 - JOIN NOW! To get even more personalised support, help and mindset work, why not add some 1:1 sessions? Instructions will be sent to you on how to access the course and the support group once payment has been received.